Home BOLLYWOOD Ayesha Takia’s Husband Farhan Azmi Receives Death Threats For Marrying Her! 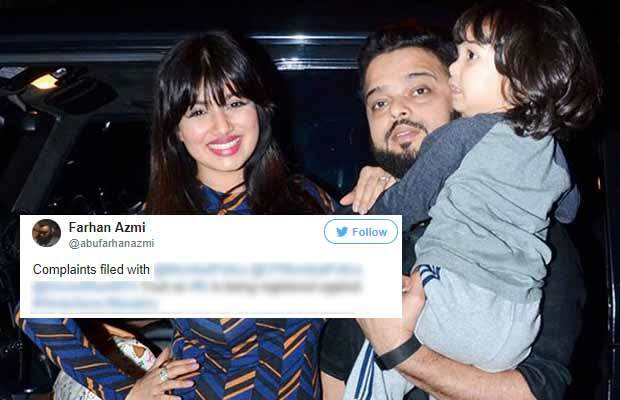 Ayesha Takia’s Husband Farhan Azmi Receives Death Threats For Marrying Her! The Bollywood actress Ayesha Takia was always the non-controversial girl, doing cute films and charming her fans. But lately the actress is back into the spotlight, and this time around for her marriage to Farhan Azmi. The Maharashtra Samajwadi Party youth president Abu Farhan Azmi filed a complaint with the Colaba Police Station when he received threats to his life. The callers claimed they were from the Hindu Sena and threatened Farhan Azmi, an hotelier by profession, for marrying a Hindu girl. They also threatened him for marrying Bollywood actress Ayesha Takia and called it an act of Love Jihad. The callers also threatened to plant bombs in the houses, offices and vehicles. The leader filed an FIR against a Rajasthan Hindu activist group for making the calls. The act was seen as incitement to communal disruption and is being treated as such by the police. Farhan Azmi’s father Abu Azmi was a former member of the Rajya Sabha. He also received threats along with his son. The complaint has been lodged with the Mumbai Police and IPS Deven Bharti. He shared a picture of the FIR reports on his twitter account. The Samajwadi Party leader Abu Azmi’s son Farhan Azmi married Ayesha Takia in 2009. The couple has a 3-year-old son named Mikail. It sure is unfortunate that her happy marriage is now being attacked.